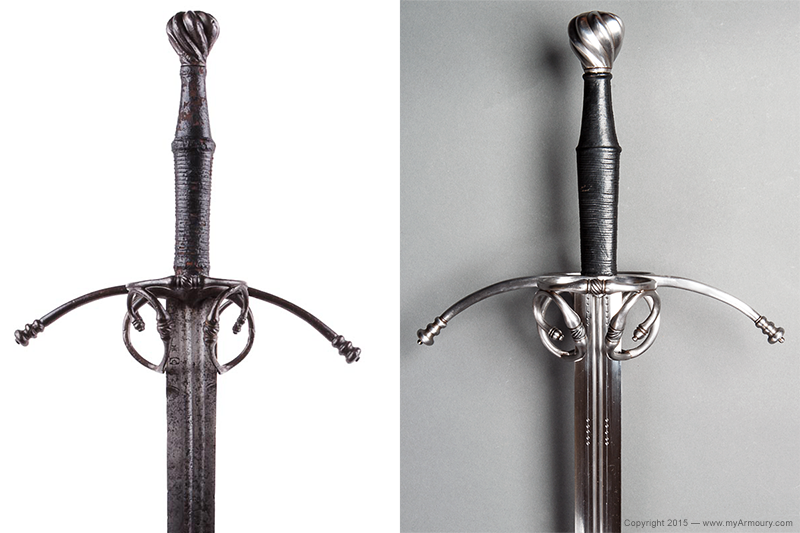 This sword is based on two extant originals, including this antique shown here that's located in a private collection. I should have attempted to take my photo at the same angle as the antique's photo. If I did, it would be more obvious that the proportions of the recreation very closely match the antique. 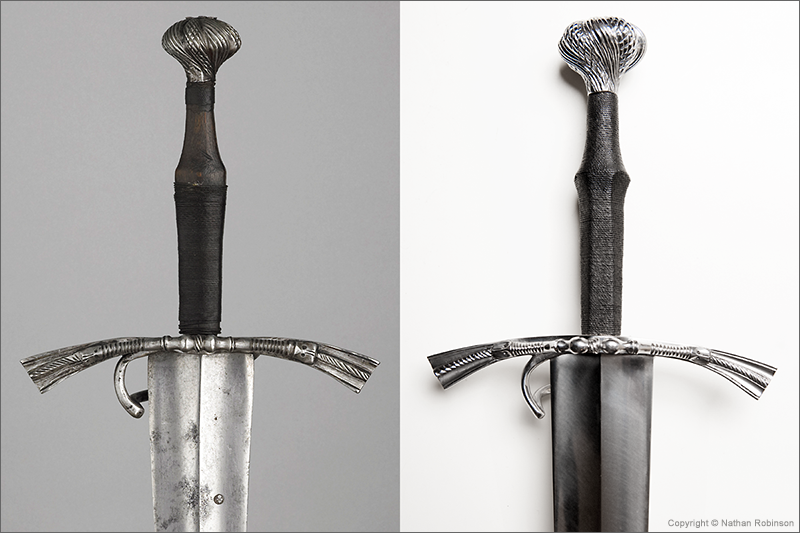 Some variation was added to closer match the details of the other antique that inspired this piece, and a thumb-ring was added in a style appropriate for the era and region of this sword. 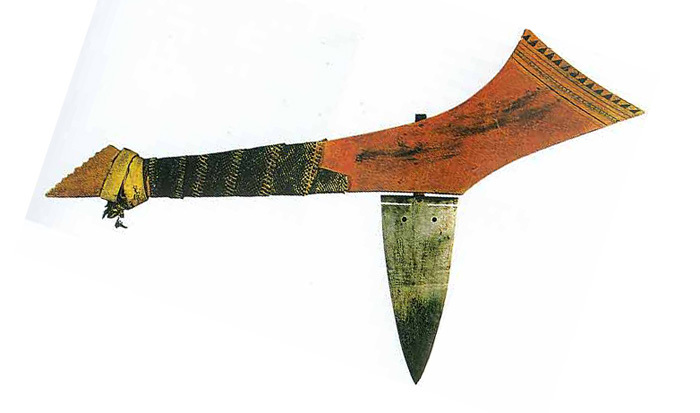 The Type XIX blade with its hexagonal cross-section has multiple fullers, a ricasso, and incised decorative lines. It was made to closely match a blade found on another example. 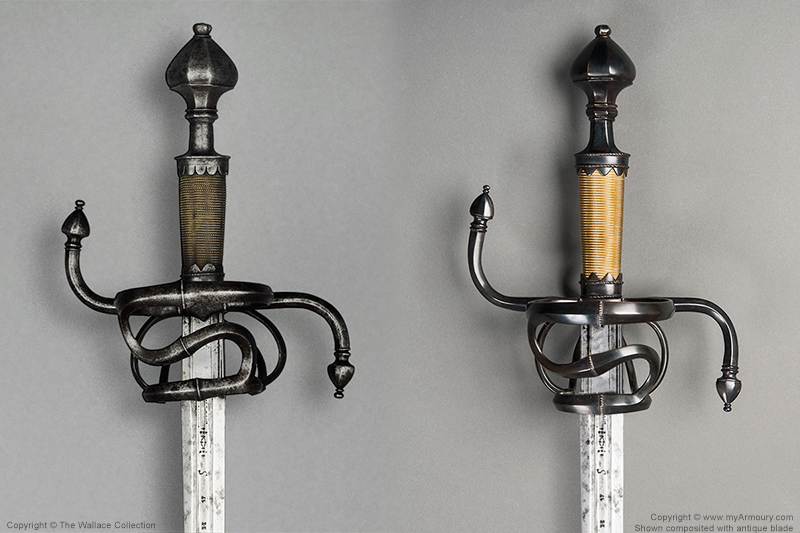 The modern hilt is a very close match to the antique with just some details of the pommel not represented. I did not have access to photos or stats of the original blade, and so opted to have a multi-fullered hexagonal cross-sectioned blade created to my liking. The overall dimensions are close to the original. 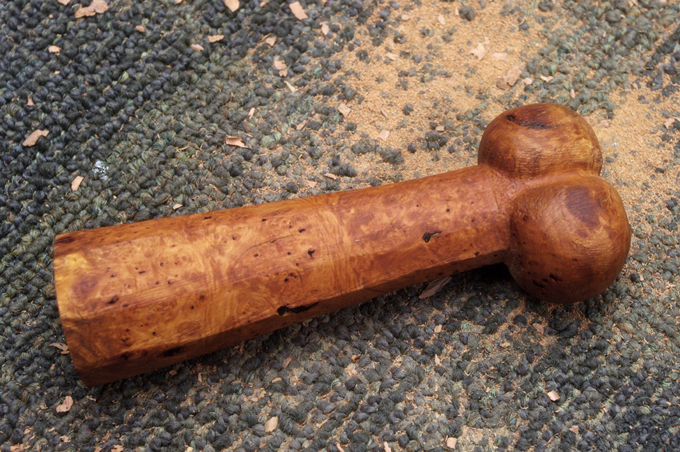 This hilt was based on A491 from The Wallace Collection. It's a very close match, but some of the sloppiness of the original hilt parts (perhaps later additions) has been cleaned up. I have not had a blade mated to this hilt yet and so it's shown here with the antique blade composited onto it as a design guide. 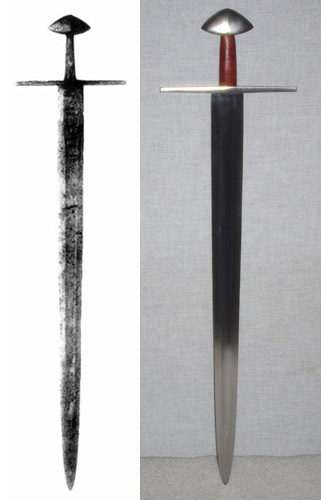 Original: Type X sword from "Sword in the Age of Chivalry"
Interesting to compare to the version of the same sword A&A did for me, shown earlier in this thread. The obvious difference is that mine has the full 34" blade but there are other subtle differences. 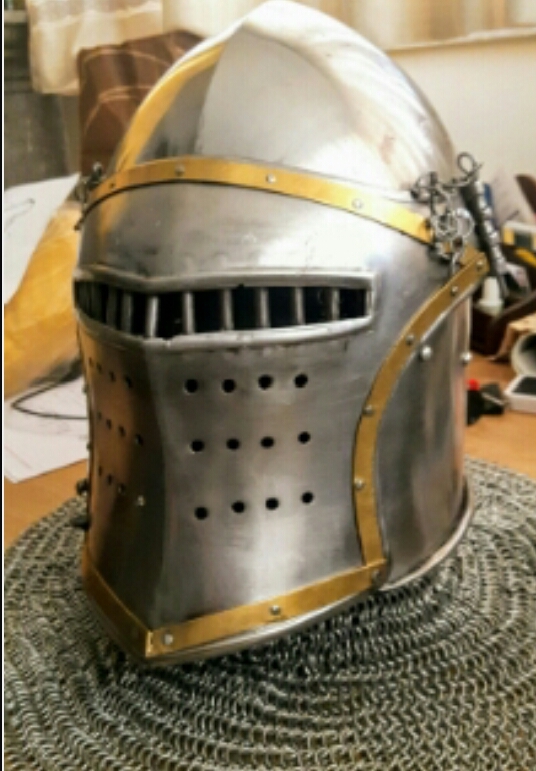 I like the profile of your blade (more like Albion's Reeve) and the more curved under-side of your pommel looks like it might be more comfortable in the hammer grip. Although I have a soft spot for long bladed swords, this compact version looks very well proportioned! Here's a custom piece I own, made by Pavel Marek. A work in progress, still searching where to get the decorations done. 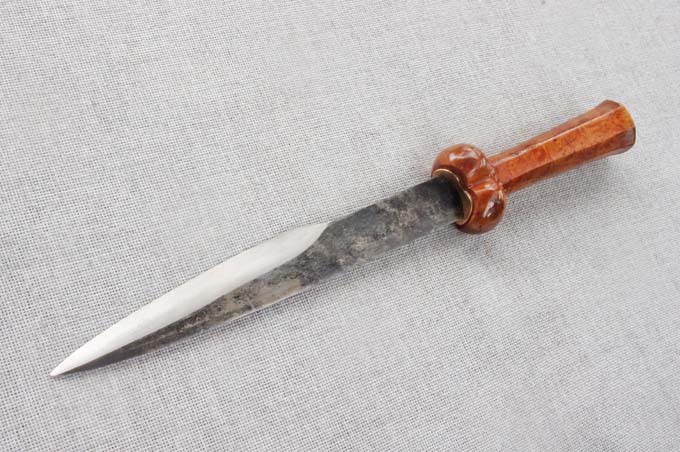 The original is a 15th century dagger from Burgundy - I found very little source material on it. In case someone has additional information on the original, feel free to write me! 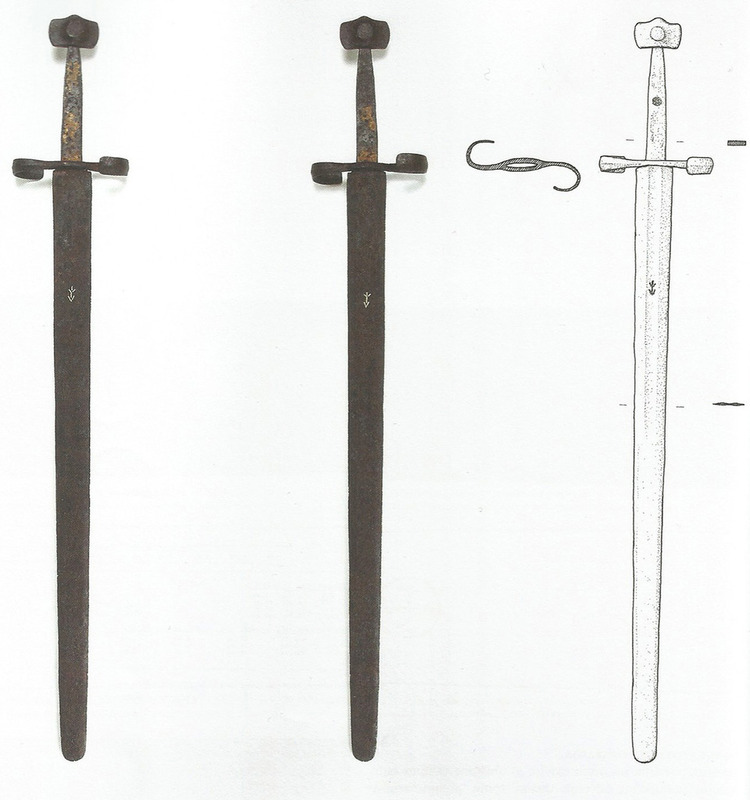 So, this is a type XIIIa schiavonesca sword found in central Croatia, in riverbed near the town of Duga Resa - probably a work of a local smith judging from the marks on the hilt - which is now kept in Croatian Historical Museum, Zagreb. 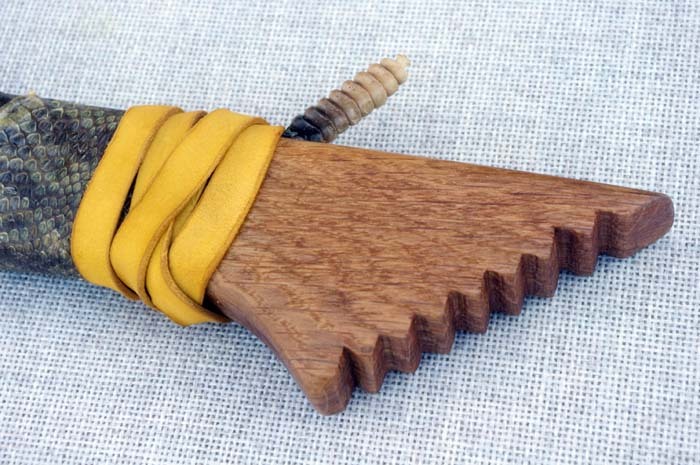 And this is a custom piece based on it, made for me by Michal Spilka of Nielo swords. Now, we didn't really made an exact replica. The original is 110 cm (43.3'') long, with 88 cm (34.6'') long blade, and around 1,48 kg (3 lbs 4 oz); the custom piece is bigger, 123 cm (48.6'') long with 96.5 cm (37.9'') long blade, and around 1,68 kg (3 lbs 11 oz). I really needed a longer hilt to handle the sword properly. 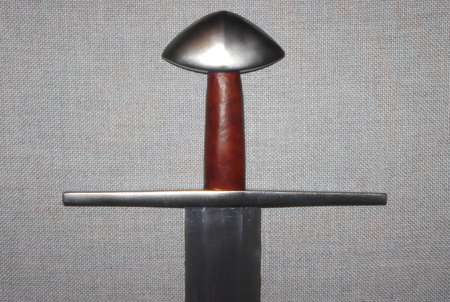 Also, we inverted the S curvature of the crossguard, to follow the grip of left-handed swordsman (me, that is). The overall proportions and design of the sword, however, remained more-less the same. I'm really pleased with how it turned out, and believe it looks and feels very close to the original: a really powerful, true type XIIIa blade. Luka, congratulations on having that sword made. I am a big fan of the Type XIIIa and this is a great representation of it. I hope you enjoy it as it looks great! Here is a ballock dagger that I forged (bottom), based on a historical example (top). It was my second attempt at reproducing this dagger, gonna have to try one more time to see if I can get it right. Both are 40 cm in overall length. My blade is 10-1/8 inches long versus 10-3/4 inches with the historical dagger. 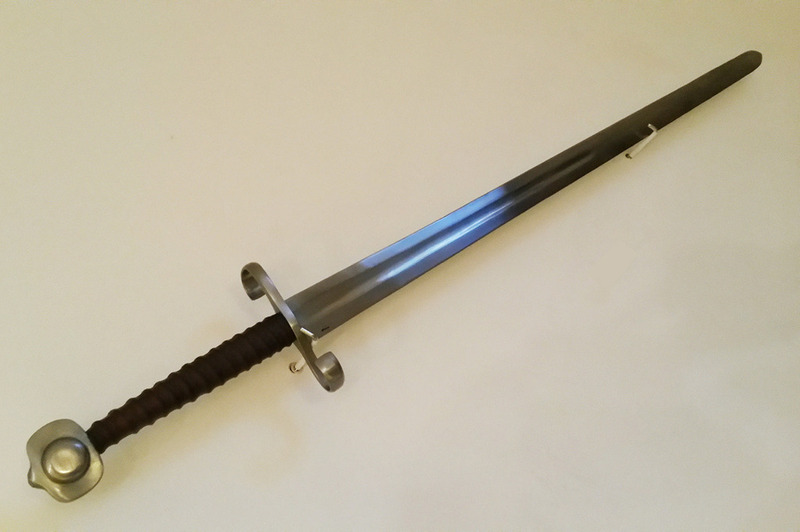 Just got Mateusz Sulowski's version of the famous sword from the Deutsches Klingenmusem, in Solingen, Germany. Very pleased with it. Beautifully executed. I'm not sure what more you can do to perfect it over and above what you have already accomplished. I've been wanting to make this for a long time. 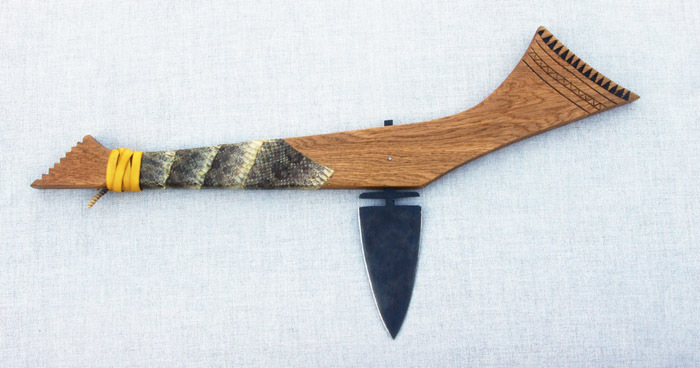 It's a reproduction of a 19th century gunstock war club from the Osage Nation. The "dag" bayonet is a reproduction of 18th and 19th Century iron blades that were mass produced by the Hudson Bay Company for trade with Native Americans. Nice to see some more cultural variety on this thread. Well done. 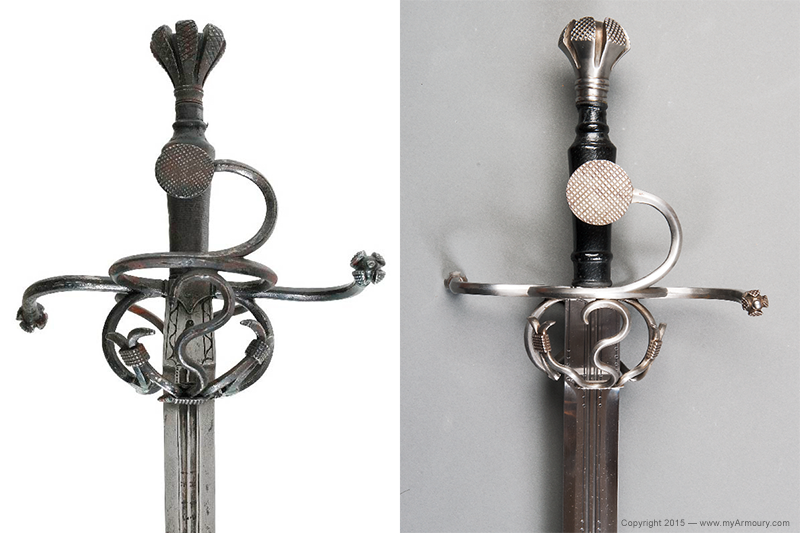 This sword is based on A479 from The Wallace Collection. The maker, Tod, documented the antique extensively and recreated the piece about as close as can be done. The photo angle doesn't quite match here, but the two hilts are nearly exact in terms of proportions, size, and volumes. The blade is a deeply hollow-ground double-edged blade that is made to match the original. I'm actually curious about what you think, is this more Italian or Germanic to you? 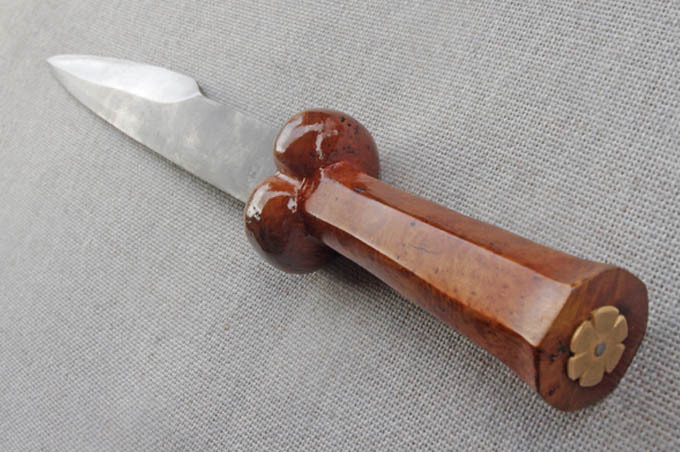 I made another reproduction ballock dagger. That's really great, Harry! Pretty much looks just like it.